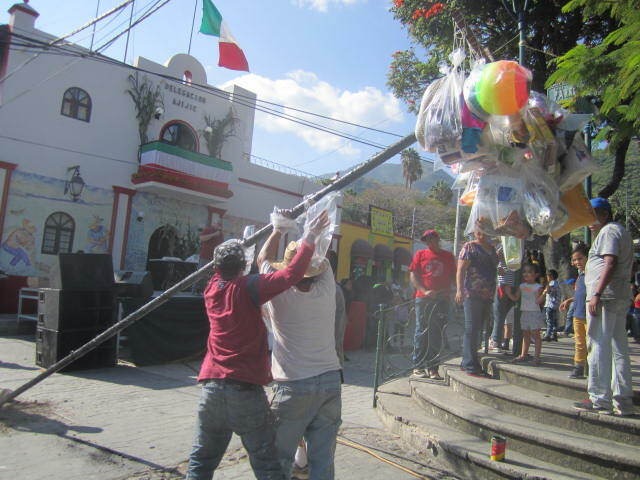 Mexican Independence celebrations start with the Globos. This year the Globos went up on Sept 10th. After that, every day was another event. I didn’t have enough energy to see all of them. But I enjoyed what I managed to see. 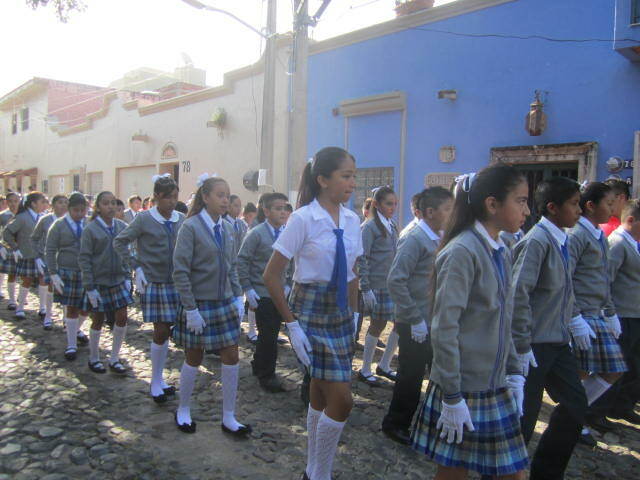 Mexican Independence Day is a celebration of Mexico’s independence from Spain which started with Father Miguel Hidalgo y Costilla reading el Grito on Sept 16th, 1810. 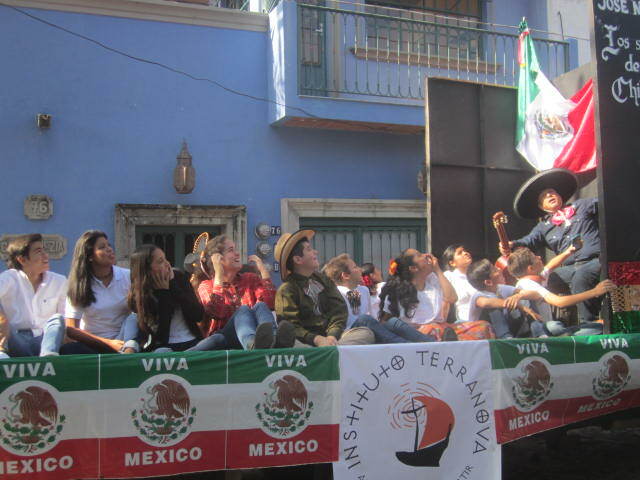 It was a proclamation of independence from Spain and it is read at the same time, ten pm from the plazas of every town in Mexico on Sept 15th. Sept. 16th was the beginning of the war with Spain. It ended in 1821. I love the above photo. 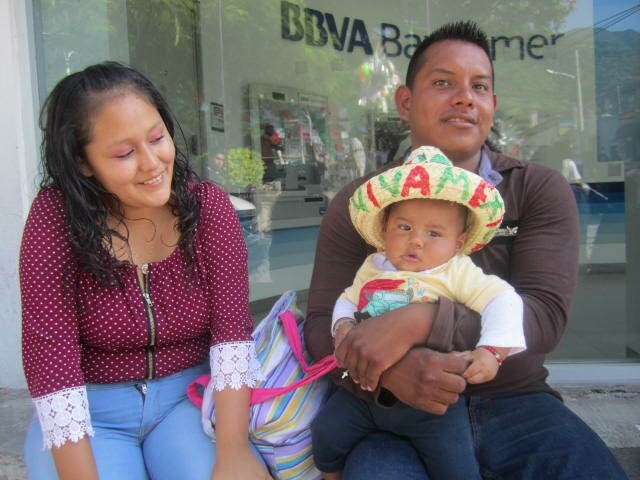 What a happy family! This is what celebrations are all about. Enjoying life to the fullest with our loved ones. 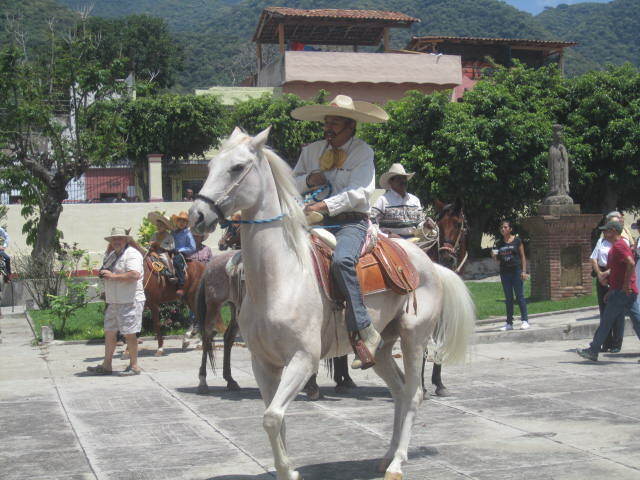 I believe the above photo is the blessing of the horses by the priest. I arrived a little late so I am not sure if that happened or not. 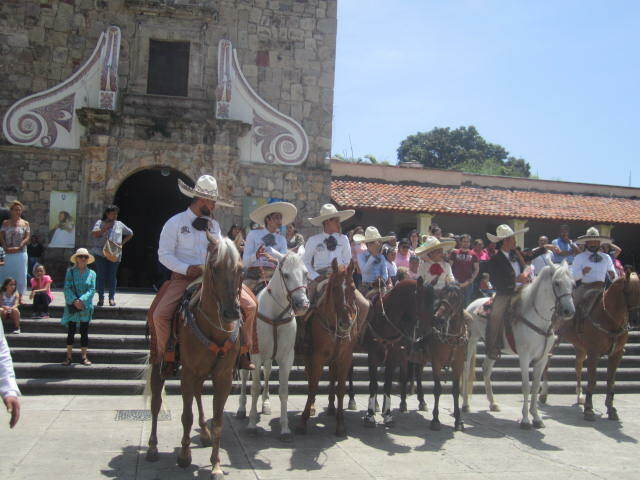 All I saw were many beautiful horses milling around in front of the church. 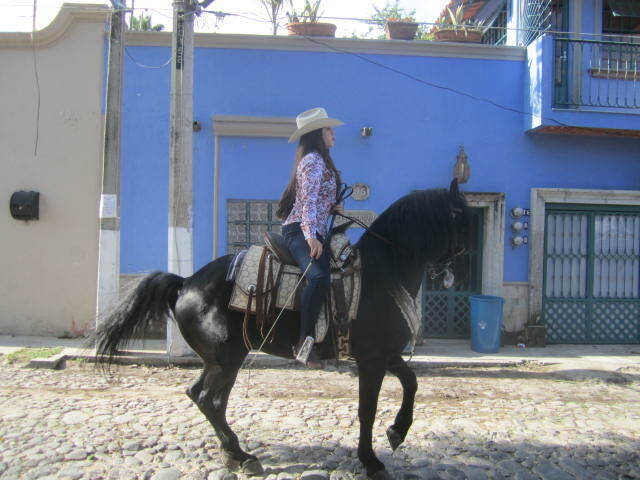 There were also beautiful women in spectacular dresses and handsome men on those horses. For a week before Independence Day there were activities going on day and night. 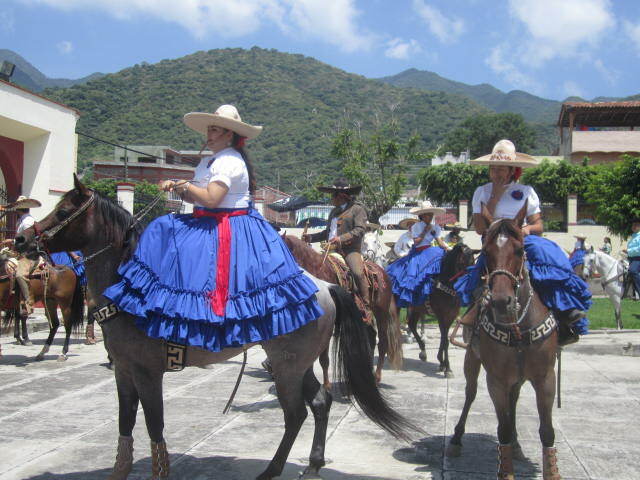 I am sorry that I missed the Escaramuza women. It started at three in the afternoon after all the horses left the church. 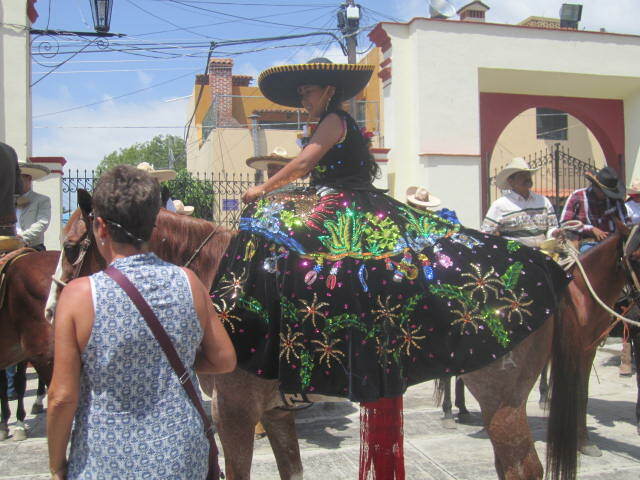 I have an article on this site about the Escaramuza riders if you would like to see s0me photos of a previous one. The horse in the above photo was dancing while leaving the church grounds. Several of the horses danced out the gate. I liked watching them but took care not to get too close. 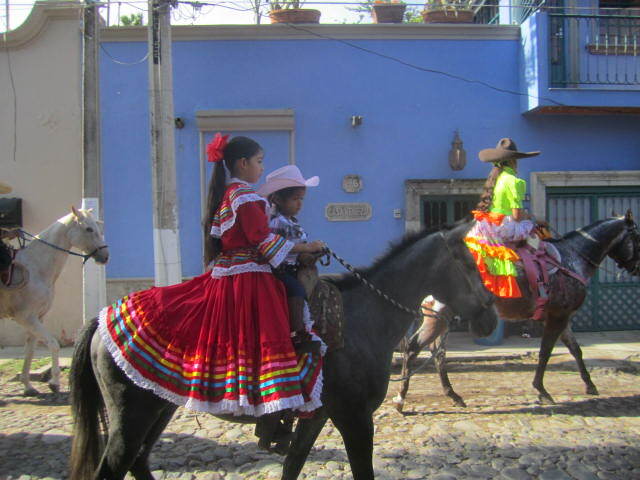 After the parade of horses from the church, everyone gathered at the Ajijic Plaza. The plaza was a busy place for the week of celebrations. 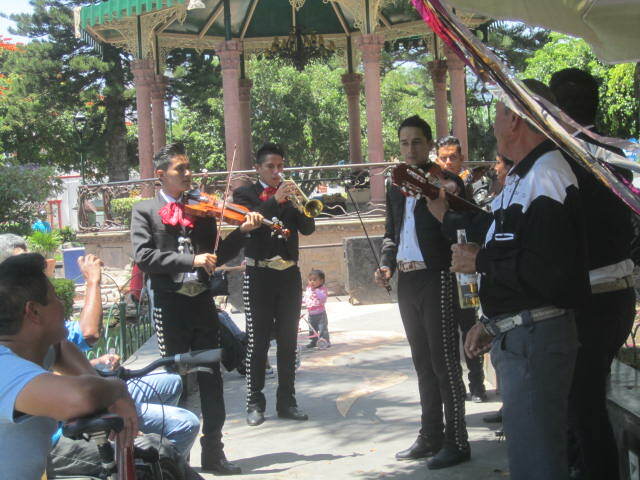 I always enjoy hearing the mariachi bands playing and one was there that day. Lucky me. Check out the little girl in the background. She kept walking around between them. I think she was curious. 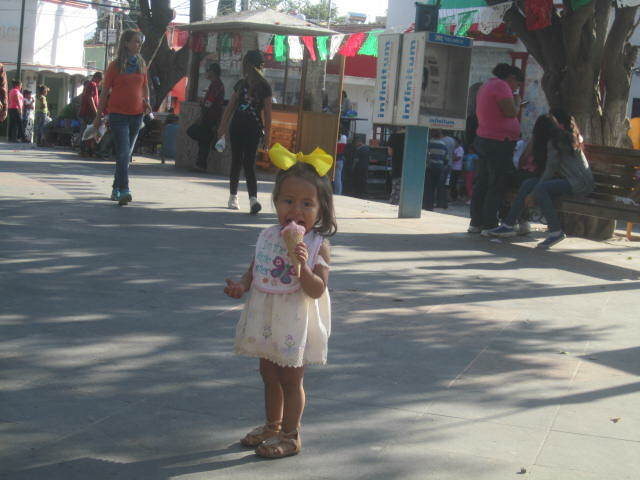 I couldn’t resist taking a photo of this little girl with the yellow ribbon in her, eating ice cream. She took about half an hour to eat it and it was all over her face and dress by the time she finished but she really enjoyed it. The next celebration that I managed to attend was an evening of games for the children. 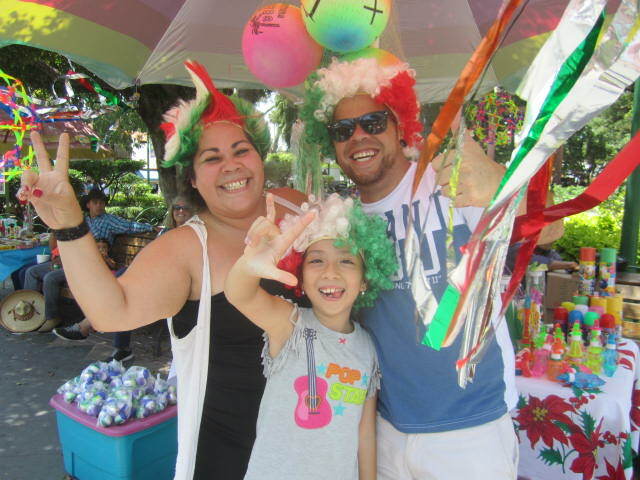 There were a lot of families and everyone was having fun. 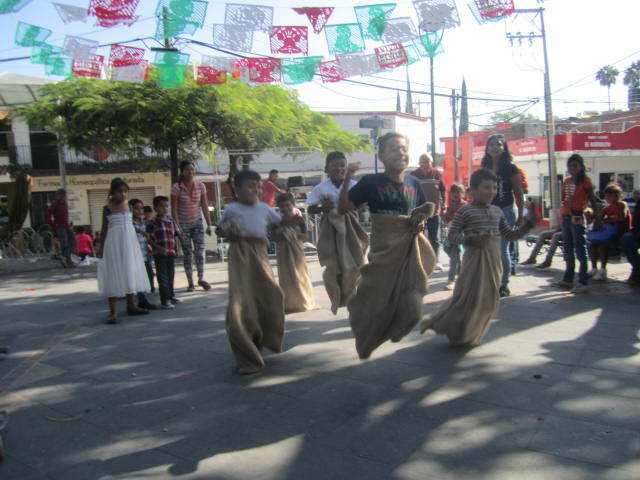 There were several sack races and prizes for the winners. They also had a hot chili pepper eating contest and my favorite which is the greased pole climb. Unfortunately I missed the pole climb but here is a photo of them putting it up. The children take turns climbing up the greased pole to try to grab the bags of prizes at the top. I am sorry that I missed this event. But it was two hours later than planned and I was too tired to wait any longer. Never expect things to happen at the time they say… I must remember MT which means Mexican Time. Not AT which means American time. At every event there is food. Lots of food. Healthy food. Unhealthy food. Just about anything you want you can find in a stand. 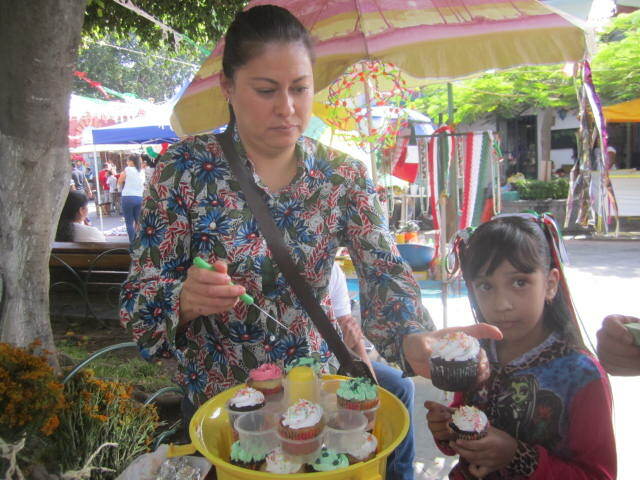 How about a homemade cupcake for dessert? Or a piece of cake? Or a piece of pie? How about some popcorn? Or if you want to eat healthy food, someone was selling cooked vegetables. Many choices at every event. No reason for anyone to go hungry. 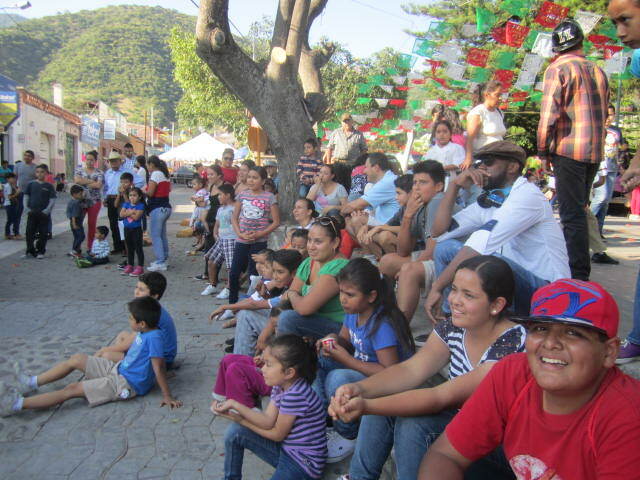 The above photo was just a small part of the crowd that was gathered at the children’s event. The next event I managed to attend was the parade on Sept. 16th. Hundreds of children were marching in it. I must have taken thirty photos of children marching. Marching, marching. But I only put a few on here. I don’t know what the mariachi man was doing in the front of that truck but he had the kids in stitches, laughing at him. Now that is the way to go, forget about all that marching. I loved seeing the beautiful dresses that the young girls and women were wearing. This young girl looks like she is taking care of her little brother. What a great big sister! I enjoyed watching this horse dancing but I was worried. I don’t know if you can see from this photo but the horse is foaming at the mouth. I know nothing about horses but that doesn’t seem like a good thing. 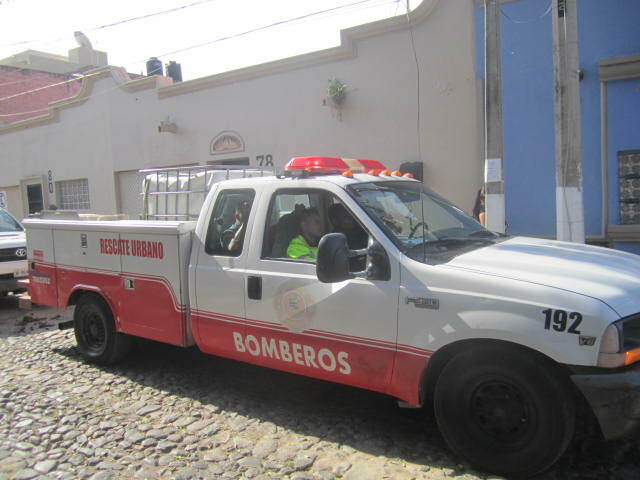 The fire trucks and police cars are always in the parades. Sometimes at the end. Sometimes at the beginning. This fire truck was at the end of this parade. Keeping everyone safe. This dish usually can’t be found in restaurants except during the Independence Day celebrations. 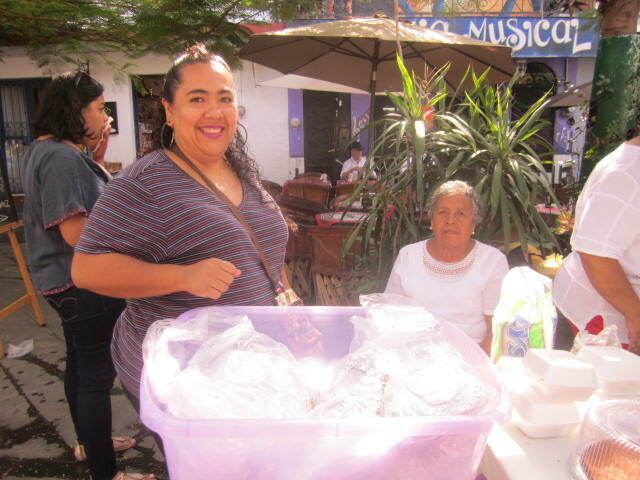 It is a traditional dish representing the three colors of the Mexican flag. The white sauce for white in the flag. 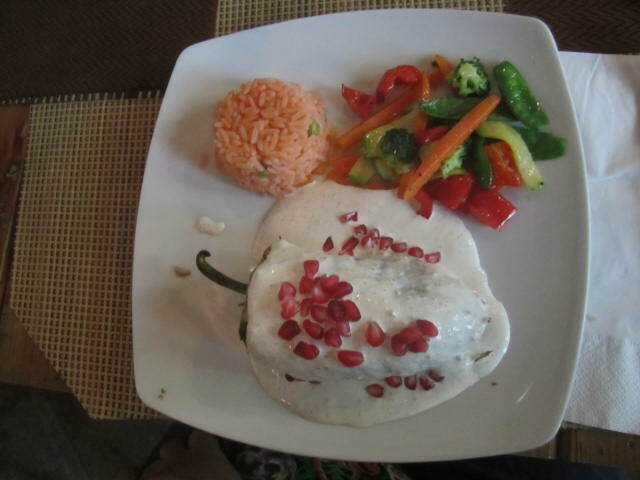 The poblano chili representing the green of the flag and the pomogranate seeds representing the red of the flag. It is delicious. 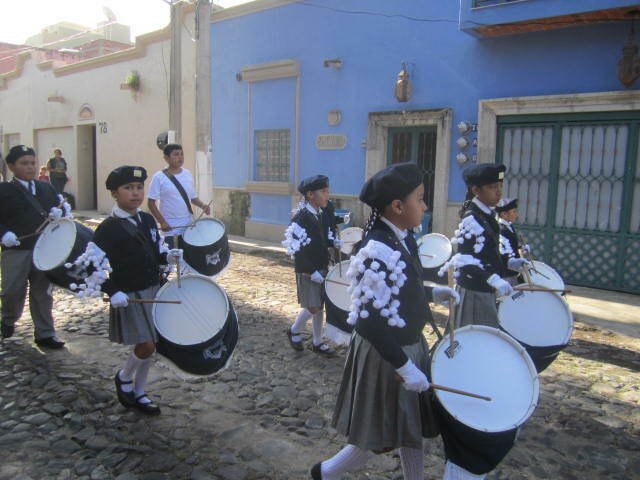 If you are thinking about visiting Mexico, I suggest you choose this time of the year, starting with the Globos event which kicks it all off and every day there is something different and exciting happening here.